The art of the twentieth century is difficult to imagine without such a landmark artist as Kazimir Malevich. It was he who at one time clearly reflected all the distortions and paradoxes of humanity for the whole world. 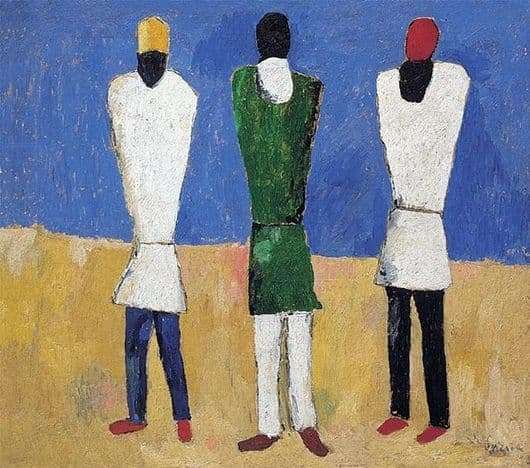 Malevich sought to reveal the art from different sides. In the painting “Peasants”, which subsequently marked the beginning of a whole cycle about the complex peasant life, three ordinary working peasants are shown. At the very beginning of the development of this subject, the artist believed that the life of the “peasant from the village” was easy and simple, because there is no need to know thousands of sciences, as well as an incredible amount of rules of grammar. Only after arriving at the fields where the peasants worked hard, he realizes that they live much harder. – The blue color that fills most of the canvas means simplicity of soul, openness to the world and constancy of spirit. – Green in the center, harmoniously blending in between symmetrical white – indicates a symbol of balance, cyclical nature of life and closeness to nature. – Black is a characteristic mask that covers all faces with black veil and, without letting you see any details. It means the color of this difficulty, the aimlessness of life in this world and the constant struggle with the upper classes, despite the abolition of serfdom. – White is presented as a symbol of hope for the future, harmoniously fitting into the cycle of all life and the image itself. Light clothes mean moving forward, with the goal of making nature objectless, which would mean a chance for cleansing from everything worldly. – But it is difficult to achieve enlightenment, and not everyone in this world is given. Red color means difficulties and obstacles that will have to be overcome in order to find a place where a cloudless sky and “white” freedom await. By imparting symbolism to the picture, Malevich achieved a great result than his artist friends. His canvas can be analyzed for hours, and each time discover something new.